30 Sep, 2018 in big why / business / comfort zone / daily practice / goals / Health / income / leadership / monday-motivations / zen by Minette Riordan, Ph.D.
You became a creative business owner to create more freedom. You envisioned freeing up more time, making more money and living your dream lifestyle. But what happens, more often than not, is that you find yourself stuck, a year or four after you open for business. You haven’t achieved the “big time”; your computer is cluttered with business folders, courses, eBooks and software you don’t even remember; and you feel like you’re stuck in a hamster wheel, running at top speed all the time—but getting nowhere. There are many causes for this type of business chaos: Some complex and some, extremely simple. Over the next few Mondays, I will be diving deep into the reasons you might be feeling overwhelmed, stuck or discouraged and share some effective strategies for moving through chaos to calm. From the space of calm, action can happen! 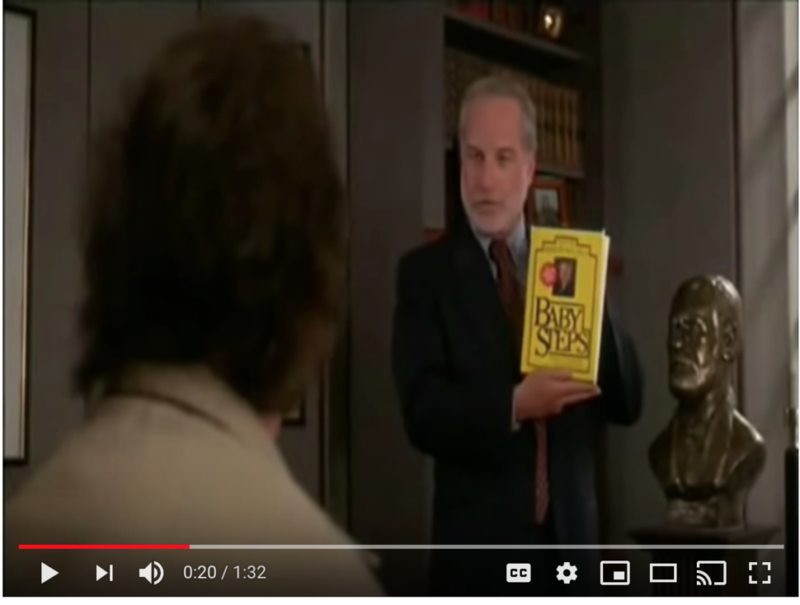 It’s all about taking baby steps, just like Bill Murray in What about Bob? I have noticed I have been obsessed with planners recently. As we enter the 4th quarter of 2018 I am already looking ahead to 2019 plans. I want to finish this year strong, I don’t need another planner that sits unused on my desk. It’s so easy for me to play in the future when what really needs my attention is in the now. Beginning of the 4th quarter is the perfect time for me to take a deep breath, pause, and do some journaling around what I might be avoiding in the moment. Why am I lingering in the future vision when action happens in the here and now? The truth? We are in the planning and launch stages of several new streams of revenue. I have started selling my art, including two commissioned pieces. My work life feels chaotic. How will I find the time for all that’s on my plate and spend time with hubby and daughter? Am I setting goals that may not be realistic given the amount of time I am traveling this month? This is chaos and insanity of my own creation. Happiness for me is when I have the time and spaciousness to do my work and live my life the way I want. What’s a creative like you or me to do? The first step is to identify what is causing the chaos. Before you can fix anything, first you need to identify the specific problem(s). Read through the following points and see if any resonate strongly with you. If you’re like most creative business owners, you will probably have found yourself answering “yes” to all of the above! Don’t worry. Next Monday in How to Get Focused in Less Than 24 Hours, I am going to show you how to find your focus and increase your happiness! But first, let’s name the chaos. Think of this as the brainstorming stage. Taking inventory of what is creating chaos is an essential step before you can deal with inner or external causes of overwhelm, so grab a journal. For each of the categories below, list what you think is causing chaos in each of the following three categories. Note: I am just listing five here. There may be more. My intention is to support you in gaining some clarity on where you are stuck, not create more overwhelm. List no more than three items in each category. Once you identify the chaos, ask yourself which of these are external and which are internal. For example, I often have unfinished projects that don’t get launched because I lack confidence. I committed in January to putting my art up for sale and it took me six months to make it happen. I created a lot of stories around it being hard and really I was scared. Once I recognized that fear was stopping me, I could name the problem and take action. I’m still scared but I am not stuck. Make sense? Pick one of the items on your list to start with. What is one key area of chaos that is simple to shift? It might be as simple as cleaning your desk or more complex like letting go of old domain names that seemed like great ideas but are no longer useful or aligned with your current business. And I will see you next week! This article was spot on! I feel like a text book case of everything you just said in this article. Definitely about to do a reset and figure out my priorities. Hi Kora, glad you found the article useful and yes, I agree, it’s the perfect time of year to do a reset and refresh! I am going to share more insights in part 2 on how to find focus for next week. ← [Monday Motivation] Who do you have to become?